There are not many things I love more than a good DIY project. There are also not many things I love more than birds on a Christmas Tree. We set ours up this season and my oldest son counted; I’ve collected 12 bird ornaments over the years. They range from small carved birds to decorated gourds to a darling little jeweled hummingbird that the Engineer and I brought home from our honeymoon. So when I decided to create some little DIY ornaments, birds (of course) were on the top of my list. First I was inspired by the Twelve Days of Christmas carol. Finding a fantastic birding article detailing exactly which birds were most likely to have been the birds mentioned in the song cinched the deal. I used that as a starting point and tried to put my own artistic spin on them. I hope you enjoy this project as much as I did! 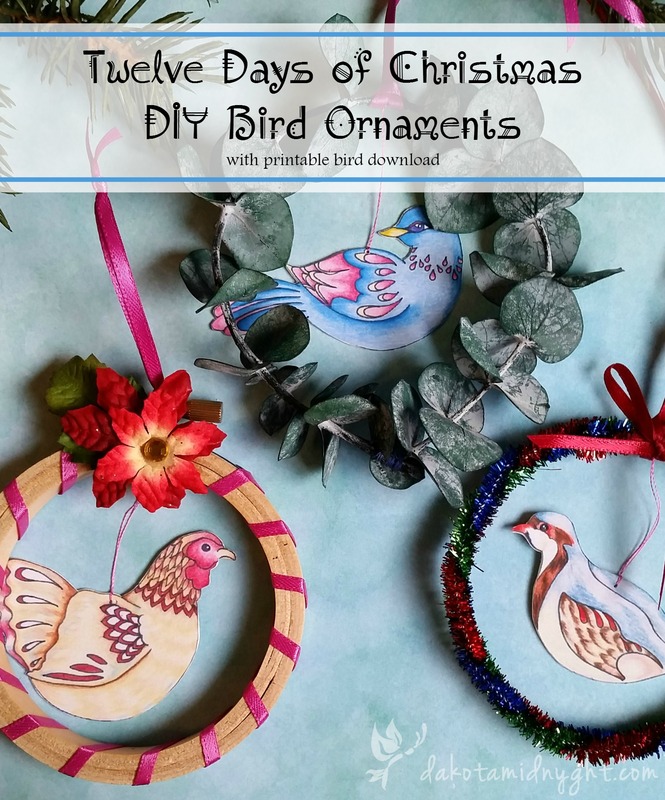 What follows is a brief materials list and tutorials for how I made these ornaments, but I could think of so many other ways to use the birds… as gift tags, scrapbooking embellishments, part or all of a hanging garland, place card decorations, envelope decorations, greeting card decorations… and there are so many other materials you could use as hoops! I’d love to know how you end up using your little birds – please feel free to tag my Instagram account (@dakotamidnyght) or Facebook page (DakotaMidnyght) with pictures of your creations! Note: To access the free download, please sign up for my newsletter! You’ll get an email with a link and password to my downloads page. This won’t be the only fun gift – I’ve got more goodies in the works for my newsletter subscribers! 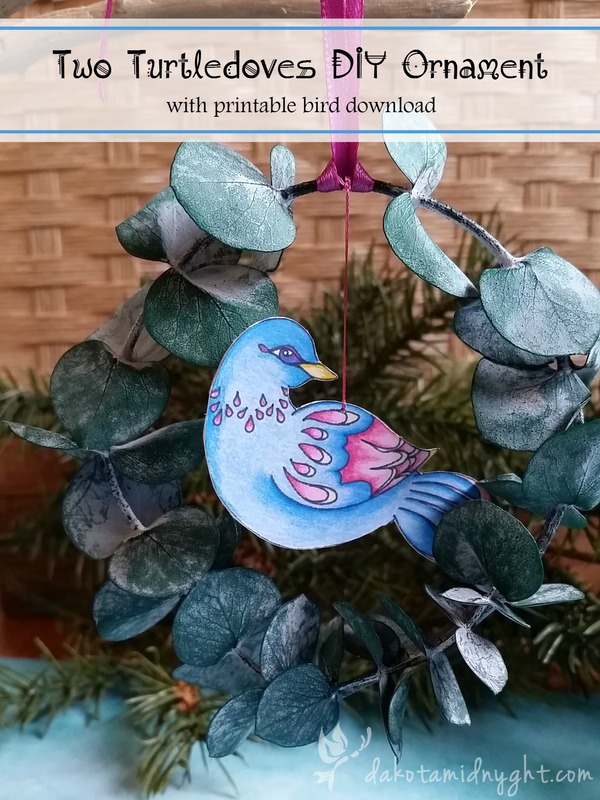 12 Days of Christmas Bird Ornaments (CMYK) – Use this file if you are doing your printing at a Staples, Kinkos, or an equivalent printing center. 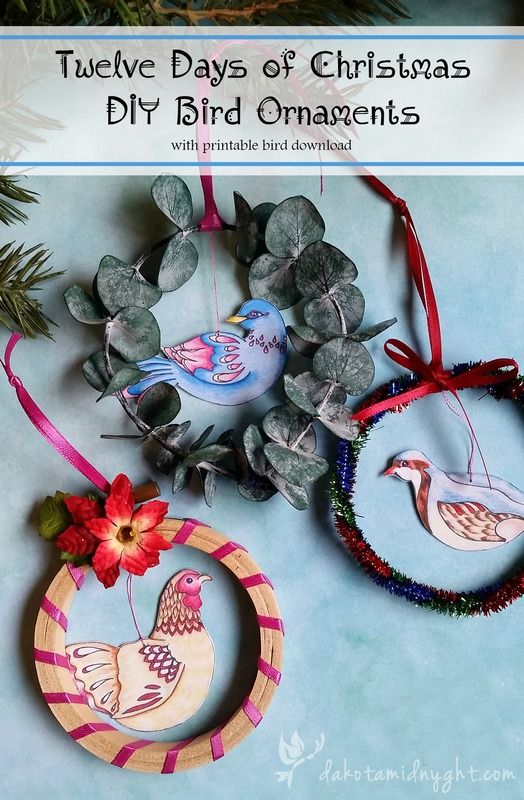 12 Days of Christmas Bird Ornaments (PDF) – Use this file with a premium paper recommendation like I’ve made below. 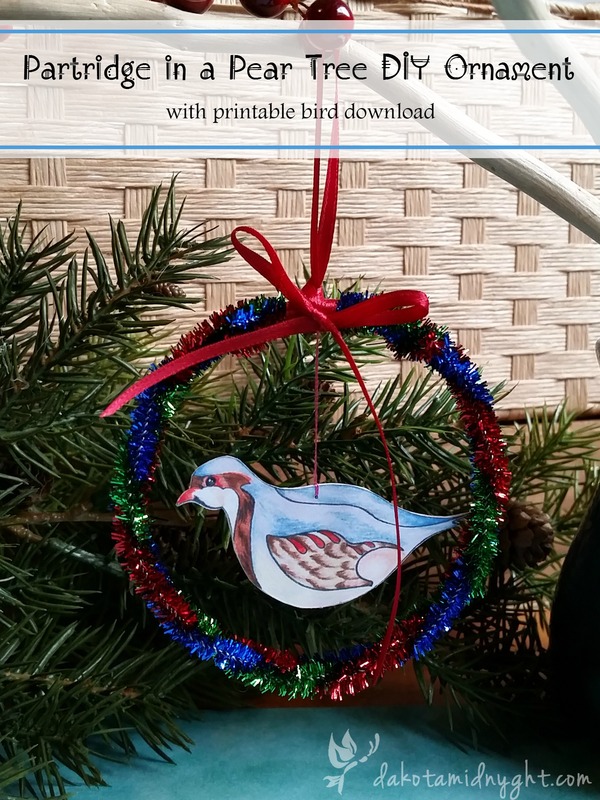 12 Days of Christmas Bird Ornaments (JPG) – Use this file for printing on a basic scrapbooking cardstock. Paper: If you can, chose a high quality presentation paper to print your birds on. I obtained the best color results using Epson Premium Presentation Matte paper. Each brand of printer will have an equivalent. Printing: Most printers should have the option to choose a “presentation” or “matte” paper under the advanced settings options – essentially, something different than plain printing paper. You can also experiment with your color controls (letting the printer control the color, or choosing no color management). I cut out each bird with a craft knife, and used a Die-Cut Adhesive to glue the wrong (white) sides together. The Die-Cut Adhesive is a sheet of tiny, sticky dots. You lay the wrong side of the cut-out down on the exposed dots, and when you pull the cut-out off, it has essentially become a sticker. You only need to “stickify” one bird-side. After gluing the two sides together, I cleaned up any uneven or exposed edges with the craft knife. If you chose to glue the birds together instead, I would chose a stick glue or scrapbooking glue instead of Modpodge. I’ve had trouble with Modpodge going on too heavy and warping the paper with past projects. You could also spray the birds after assembly with a protective acrylic spray to make them waterproof. Select three pipe cleaners in contrasting colors and braid them together. Bend the braid into a hoop, overlapping the ends by at least 1/2″. (I used a cup to bend the braid, to help create a nice circle shape.) Wrap thread around the overlapped ends to hold them securely together. Tie off the threads and trim. Pierce the bird in the top middle of the back with a needle and thread. Leaving enough thread for the bird to swing freely, tie the end around the hoop in the same spot where you secured the ends of the pipe cleaners together. Cut two lengths of ribbon – each at least 8″ long. Secure the first piece of ribbon in a Larks head knot over the thread wrappings – this becomes your ornament hanger. Loosen the knot slightly, and thread the second piece of ribbon between the loop and free ends of the knot. (The second ribbon will brush up against the pipe cleaners, and lie underneath the first ribbon.) Tie the second piece of ribbon into a bow – once you tie it, it will be secured around the first ribbon and will stay in place. Trim the ends of the second ribbon so they’re even, and you’re done! Cut a long stem of Eucalyptus. The longer the stem, the bigger your hoop can be. The hoop needs to be at least 3″ in diameter. Overlap the ends of the stem, and wrap thread around both to secure the stem into a hoop. Tie off the thread. Determine if you want the tied portion of the hoop to be on the top or the bottom – I kept mine on the bottom because I thought it looked better, but you may decide differently. Pierce the bird in the top middle of the back with a needle and thread. Leaving enough thread for the bird to swing freely, tie the end around the top of the hoop. Cut a piece of ribbon to at least 8″ long. Using a Larks head knot, secure the ribbon around the top of the hoop for your ornament hanger. Cut an 18-24″ piece of ribbon (you will use more the tighter you wrap the ribbon). I secured the end of my ribbon by popping open the two rings, sticking the end of the ribbon in between them at an angle, and re-closing and tightening the hoop. After I finished wrapping the ribbon, I did the same process to secure the other end. Then I trimmed the ends close to the wood. This was a little bit difficult to do, but was very effective – it would be easier, however, to tie off or glue the ends. After wrapping the ribbon, pierce the bird in the top middle of the back with a needle and thread. Leaving enough thread for the bird to swing freely, tie the end around the top of the hoop. Cut a piece of ribbon to at least 8″ long. 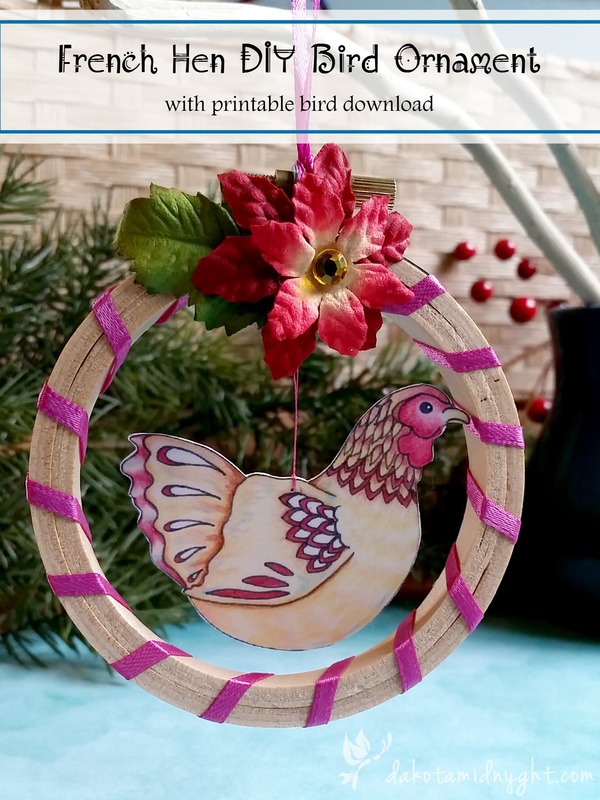 Using a Larks head knot, secure the ribbon around the top of the hoop for your ornament hanger. At this point, I glued some scrapbook poinsettia flowers on to embellish the top, and used a stray rhinestone for the center. You could use flowers, tiny pine cones, buttons, or simply a ribbon bow. Ready to make some ornaments?! >>>Click here<<< to download your ornament file. Remember you need the password from the newsletter to access the files! Dakota, these are breathtakingly lovely!! I luuurve the turtledoves!! The eucalyptus stem gives it a magical woodland character. And the blue in the background! The blue. BLUE. The blue. ?????????? Ah Swati, thank you so much!!! Bev – thank you!!! I am fairly obsessed with color-output. It’s part of why I haven’t ever farmed out my art prints – I print them all at home so I can make sure every. single. one. is right!